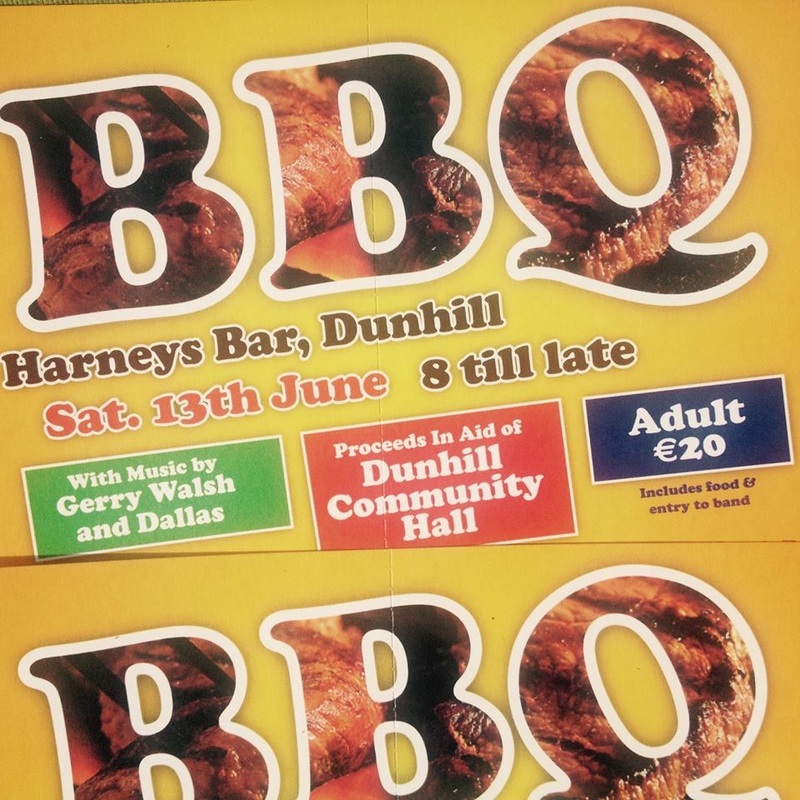 BBQ in Harneys Saturday 13th June 8 till late. Proceeds in aid of Dunhill Community Hall. 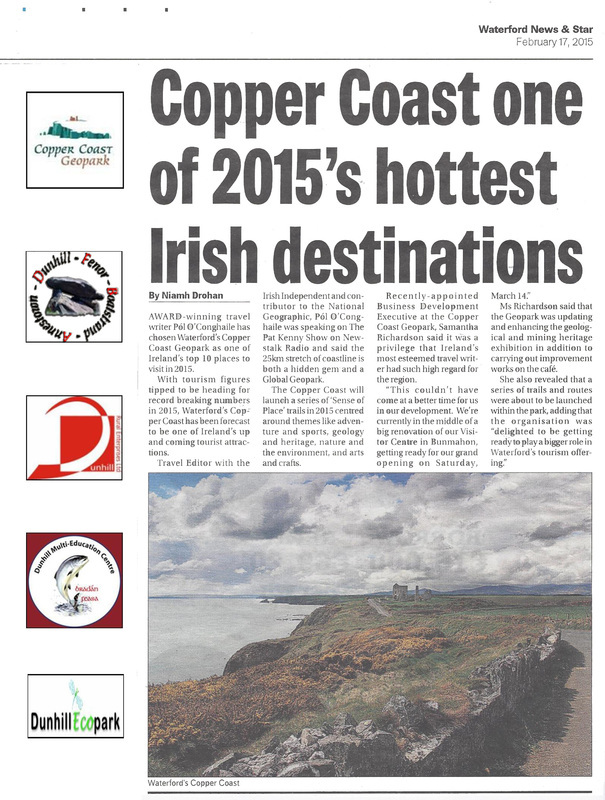 The Copper Coast has received a glowing review from Irish Independent travel writer Pól O'Conghaile describing it as a "hidden gem". 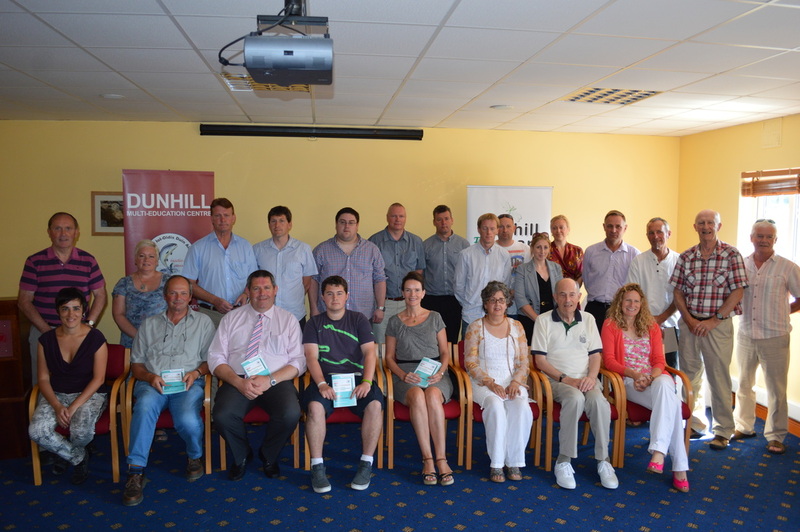 The launch of local DFBA (Dunhill-Fenor-Boatstrand-Annestown) Directory took place in Dunhill on Friday 25th July 2014 with Lar Power, Director of Enterprise Waterford City & County Council doing the honours. It was a milestone event for Dunhill Rural Enterprises Ltd. The aim of the directory is to (1) promote awareness of and support for local businesses and voluntary organisations in the parish (2) increase inter and referral business activity and (3) promote the concept of a local micro-economy which is self reliant and sustainable and is capable of driving social and economic progress in the parish of Dunhill –Fenor over the next decade. Dunhill, Co. Waterford and the surrounding areas were a hive of activity the summer of 2013 as the far flung branches of the Power Clan reunited for a 5-day event as part of the national government initiative, the 2013 Gathering. More people have the surname Power in County Waterford than any other name, and the event was a time to celebrate all those who have affiliation to this, at home and abroad, by blood, kin or affection. The event was launched on Friday 31st of May, with a 'walking in the footsteps of your ancestors' stroll through the stunning Anne Valley, a world-leading wetlands project, with tree planting and a blessing commemorating our Power ancestors. Leading to Dunhill Castle, the ancestral seat of all Power families, were revelers were met by the original Power - Robert De La Poer who regaled all with the legends and stories of the Powers. The afternoon followed with an evening of local food at Harney's Pub Dunhill, with historical stories told by Julian Walton, followed by music and 'Dancing at the Crossroads'. The Power Clan weekend involved a whole host of events based around Power heritage such as historical walks and lectures, to boat trips, horse racing, battle re-enactments and of course good food, great music and Irish craic. As the brainchild of the Irish Newfoundland Connection (INC) and DFBA (Dunhill Fenor Boatstrand Annestown Community Enterprises Ltd), the organisers attracted visitors from areas overseas where emigration by Powers was the strongest, focusing on strong existing links with Newfoundland, Canada as well as the Powers closer to home in Waterford. The events provided an opportunity for people to see where their ancestors’ story started from their arrival in Ireland with Strongbow in 1169, as well as having a unique opportunity to meet other clan members and strengthen the links between the branches of the extended family. Tours of Power country, including the Copper Coast and significant Power sites as well as a battle re-enactment in Tramore were be held. The event, organised by a Dunhill-based steering group, secured flagship funding through Waterford City and County councils – the only family event under the Gathering/IPB funding programme to do so.